After learning the Eye was sold again, we tryed to find out if and how one may get along with the new owners. 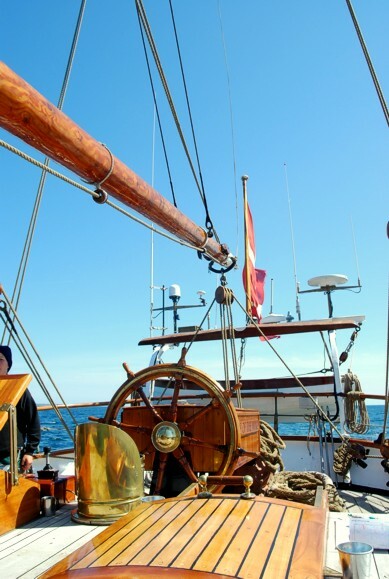 Ros wrote an initial mail, then the things developed quickly and suddenly I found myself invited to join the ship from the yacht racing week in Kiel to Frederickshavn in Denmark. I hadn't seen her since the 2001 refit and now she was in Germany - the travel distance would hardly get any shorter. She was a bit outside the city at the Thiessen quai in Holtenau. The good news is: She still looks great. The bad news is: she doesn't make people dropping their jaws anymore. Getting closer, you find a number of smaller and bigger changes. Some of them are good or great, some alright, some others only can count as scars and wounds. A nice one is certainly the new generator. It is so silent you normally wouldn't notice it's running. When it went off, I only felt the stop of a very gentle vibration in my bunk, that was all. No way anymore to use it as a wakeup call. It wouldn't only fail with me, that even would have failed with Angie. Also, the new engine makes the ship going much quicker under power. Laurens, the new captain, sais, it also was a very silent one, but I am not sure under full power it was a difference. But it's 8 years now since I heard it last time, so maybe the sound faded within time. Anyway, the engine room access and the hatches remain closed, so I suppose it also is a properly cooled one. There is a new teak deck. That is good, but one sees she wasn't meant to sail the tropics with it. There are screws heads and other stuff sticking out of it so a wrong barefoot step may become pretty painful. The roofs of the decks houses and especially the fore deck are very tidy now. This is talking of looks, not of usefulness. The ship has no inflatable anymore, so no inflatable requires room. 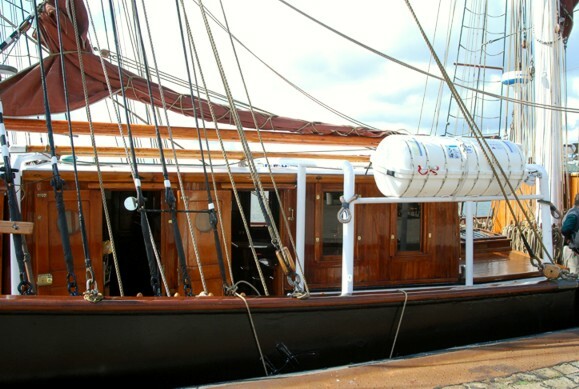 One only has rubbish of 10 people and a daily harbour, so no rubbish bins on deck anymore. But apart from that, it is certainly that "keep your stuff effect" we all experience. You don't realize you don't need all the things you kept before you move out of your flat. In the upper saloon roof now two pairs of beamers are built in, pointing aloft. I haven't been on the mast in the night, but I can imagine they are useful. And I would like to know how often they've been used yet. A really good one that was used during these couple of days is the new horn - the old one was really the only pathetic part of the old Eye I was aware of. Not experienced running, but existing is air condition and heating. So chances are, one may get warm under cold condions in less that one hour in the bunk or won't appreciate a sleeping place on deck anymore when sailing the tropics. Remember the little fans with the helicopter racket? It'll be so good not to have them anymore! Coming from the cabins to the lower saloon, you will find it changed, but in a way that intends to keep the look (like nearly all changes did) and appears useful to me. One now has not only the books, it's also tv and a DVD player along with a number of records. Passing that saloon, you get to the freezer that is now a freezer room. We did not suffer from malnutrition at any time, but that should provide new possibilities. And finally for the good part: She still is a girls ship. 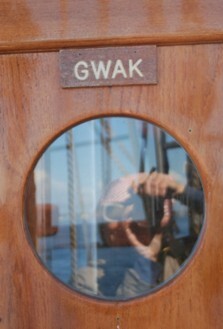 While on other vessels you mostly see men, in the Eye still about half of the crew is female. Now proceeding to the things I'd judge neutral or noticed and wouldn't judge. First of all, the ship is run with a different philosophy. The things are more relaxed and sometimes laid back. Still, everything that needs to work, does. And indeed, one doesn't need to be prepared for any open Ocean disaster at any time, if the ship spends its time in harbours and within landsight. How it works on the long run, is what we'll see when a long run is done. When I first came to the Eye, everyone spoke English or Australian and sometimes, I did not understand a single word of the whole talk. I'm far from saying I now would understand everything, but I definitely improved and reshaped my pretty theoretical English: One some fields it became worn, on others it was sanded, polished and varnished. Now, I nearly could do without it. These days, one speaks Dutch, German, Danish and Polish as native languages, English serving as Esperanto. Sometimes, I miss the challenge, next minute I appreciate the new-won chance to say exactly what I'd like to. So one switches languages in the middle of the talk, sometimes more than once. I only spent 3 days there, but when I noticed myself applying English grammar on German vocabulary, I felt this could develope adventorously. Talking of the more material things, one should first talk of the rigging. There are three jibs again and it looks nice. On the other hand side, the stunsail yards are removed. Maybe that's the right decision, as in 10 months on the ship I have seen them used for hours. But anyway, it's also removing ambition, so in fact, I would like to see them aloft again. 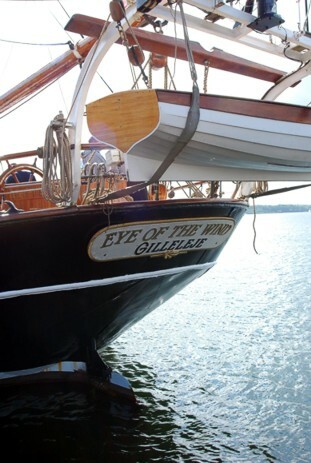 By the way: I learned, since a week the Eye of the Wind was concidered to be a brig! 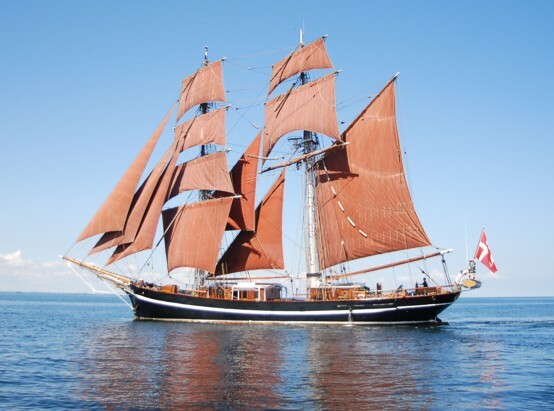 It was always that argument where and what exactly was the difference between a brig, a brigantine and a schooner(or hermaphrodite)brig and she is whatever she is since some 30 years now. So I'd say leave the word as is, but in fact, I don't care much. On a sailing vessel, things depend on the winds and they may change again, before I (possibly) change all the titles and entries of this website. So I definitely will wait for another while. Looking down again, we now have benches on the monkey poop. That seemed nice to me at first, but using them, I found they only remove the wind shelter of the engine room by lifting you up. So what I did was to take the cushions off and went back to sit on the monkey poop as done before. On the bridge, there now are speakers and good music around can be quite nice. But if you don't like it, and on a fully booked ship there will be people with a different taste all the time, that may become only a public nuisance. Of course, there also are a number of new devices and indicators on the bridge. But for them, please ask someone who understands them. So far, I am finished now with the more or less positive stuff. There is certainly more, things I did not notice or don't understand or simply forgot to mention. But now there also is the less funny part: the very first thing one comes across and cannot miss, is the varnish. On some places it looks the way we're used to, on others it's poor or nearly off. 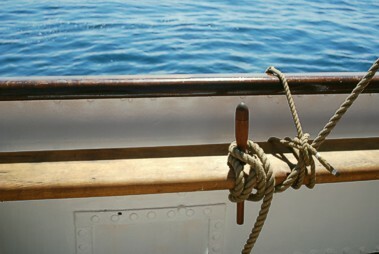 On some places under rough conditions the pinrails may soak salt water. The crew, not being familiar with what she was and what she can be, doesn't care much for it like for many other small things. They do not mean to treat her rough, they simply are not aware of what can be and what is underneath the surface. Nobody told them until the last knowledge was gone. And obviously, the former owners weren't too careful, either. I found not yet repaired scars of power impacts I do not want to imagine. Some of these scars may not be very important, but if the rudder doesn't work properly, I wouldn't call that funny. I was told, since an impact some 3 years ago, it was never properly repaired. It means, the helm now has an "auto lash" function that applies when ever no human muscle moves it. Under engine and normal conditions, one may leave it alone for minutes without even observing. As a person who was used to stear largely by judging the water pressure against the rudder, I now perform like an idiot sometimes. And indeed, there is no fun about helming her anymore. Now going down to the cabins. During the refit 2001, 5 or so of the old cabins were removed and replaced by others, that were supposed to be more modern, more comfortable. But in fact, these 3-bunks-cabins are so mindless, they aren't simply a scar of the ship, they are probably the economical death penalty. They all have their built-in heads and showers and aircondition. But no room is left for the people and their luggage. Still, they are so wide one won't get a grip once the sea gets higher. Mine had 4 doors, none of them could get operated in silence, one indeed required a hit that would stir up everyone down below. Now reckon 4 people preparing for watch at night time, 4 others returning somewhat later... Of course, these cabins were not meant for people doing watches, but in fact, I can't imagine any purpose they'd be good for. 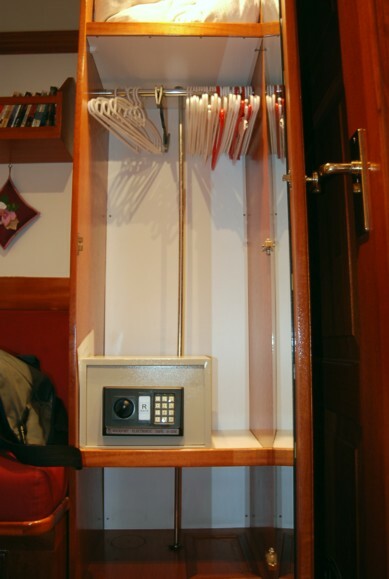 The locker now has a safe for one's jewels, but bags will only get in there, if they are soft and cheap. That is made sure by a pole in the middle that prevents any spacious gear from getting a place in here. I was the only person in that 3-people cabin so I managed to squeeze my stuff for 4 days in there. But that was it. No more stuff, no more people please. Then, the air condition requires the generator on. At night, it's normally off. So there is no air circulation in and through the cabin and, unless being dead tired, I couldn't fall asleep for the lack of oxygen. So I needed to leave the door open all night - something that certainly wouldn't please everyone who had payed 495 Euro per night and cabin! To cut a long story short, I can't see a chance to make anyone a returning customer with these cabins. People will simply feel ripped off. As far as I could find out, these cabins are bound to go and get replaced by different, more upscale ones. Well, I do not know what a person wants who joins the ship for one of the planned manager trainings, maybe the interior needs to look posh. But as we experienced, a smaller cabin can be much larger and much more useful. So I cannot see why a noble cabin shouldn't be a useful and efficient one, too. Doing that, one may carry the same amount of guests we had before and adapt the price to something more people would be able to affort. Let's hope, something like that will get done. I only spent three days and nights in the Eye this time. Two were daytrips out of Kiel, the third one was on the way to Frederikshavn. I could have stayed one or two days longer, but I wanted to meet Wolfi in Kiel, where he joined one of the races with a smaller boat. With the train connections from Frederikshavn, this would have been difficult and anyway the ship would not have made it that quickly. So I finished my supercargo existence and left in Middelfart, then spent a night in Flensburg (very nice little town!) to learn that I would miss Wolfi anyway as he would set sails for the Blue Ribbon before I'd be able to reach him. So I had some hours in Kiel having a look around and enjoying the absolutely delicious Belgian cherry beer, before I went home again.